Hongkongers love nothing more than combining drinking with people watching. It’s practically a sport, leering at passersby as they wander down Staunton, Wyndham and Hollywood. But intriguingly, our city’s drinkers covet the complete opposite approach almost as much – drinking where no one is passing by. Hongkongers (and let’s face it, anyone really) love being onto a hip, new thing that nobody else knows about, and in recent months there’s been a proliferation of such hidden bars to give all these exclusive-ites something to get excited about. Venture down any dank, feline-filled, potentially dangerous alleyway, or rap on any mysterious, unmarked side-street door, and chances are you’ll come across one of the ever-increasing covert bars that are starting to take up residence in Central. 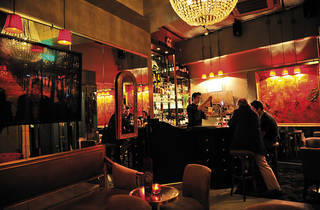 Jaabar, a lush, intimate bar just off Peel Street, is the latest to join the ranks. In the words of Jaabar’s proprietors, Jamie, Andrea and Anne (hence the ‘Jaa’), “it’s for those in the know.” ‘Exclusive’, or ‘maybe even a little bit wanky’, you might be thinking. But unlike many other recent newcomers to the hidden bar world, Jaabar is no private password establishment. There’s no strict rules of entry, no minimum spend, no demographic that you need to belong to in order to get inside. In fact, Jaabar occupies the other end of the spectrum. 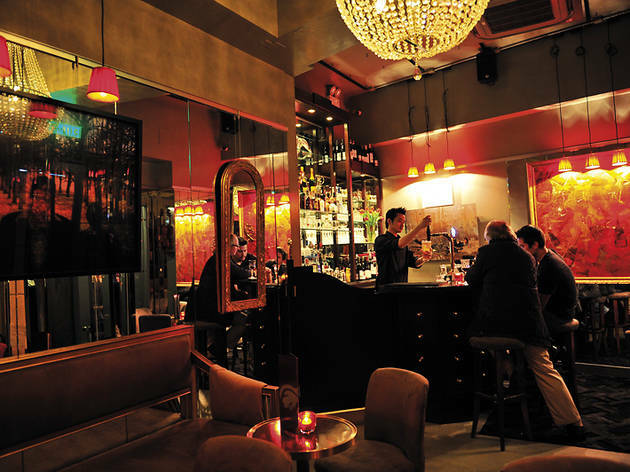 Headed up by its three uber-sociable owners, it’s welcoming, unpretentious and convivial, featuring vibrant scarlet furnishings, plush grey couches and an understated retro chandelier in a scene that’s a bit bordello. Sounds like Feather Boa, Lei Dou and Le Boudoir, then, eh? Well, not quite. It would be easy to compare it to such lounges, but Jaabar doesn’t feel like these cocktail quarters at all. In some ways, Jaabar doesn’t even feel like a bar, more like you’ve stumbled upon someone’s living room where friends and family are making a night of it. Part of this character comes through its diminutive size – it’s probably only about 400 sq ft – which immediately imposes an intimate vibe. The velvet curtains, rouge rugs, and amiably warm lighting help too. Cocktails are, naturally, part of the experience. The Jaa ($75) – an effervescent concoction of prosecco, raspberry liqueur, vodka and fresh raspberries – might bear the house name, but it’s the Obama ($75) – a delicious, refreshing and not-entirely politically correct take on the vodka mojito, featuring vodka, blackberry liqueur, blackberries and mint – that’s the highlight of the short but sweet cocktail list. Wine by the glass starts at $60 (for the decent Italian Chiaro Pinot Grigio and New Zealand’s Black Cottage Pinot Noir) and draft beer Kronenbourg checks in at $55. Compared to many flash hotspots that’ve popped up recently, Jaabar’s prices stack up pretty favourably. Pak Tsz Lane (next to the Green Mouse), Central, 2815 8887. H/H 3pm-8pm.